As many of you are aware Chris O’Meagher (or more affectionately known as ‘Bear’) is currently undergoing treatment for Pancreatic Cancer. 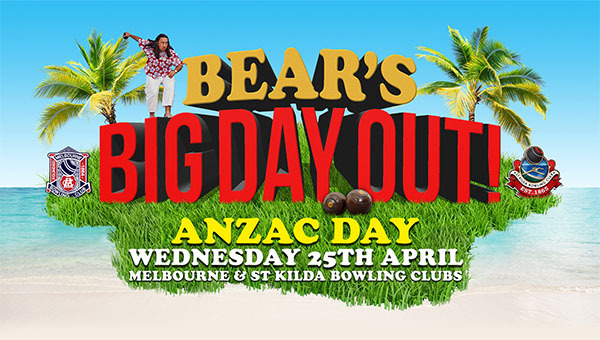 to show that the bowling community is all there to support Bear. Bear’s wish is that we use the event to create awareness for Pancreatic Cancer. Cars can be parked at St Kilda Bowling Club and buses will provided to transport players between St Kilda and Melbourne Bowling Clubs over the course of the day. As it is Anzac Day, you may want to consider starting your day at the dawn service at the Shrine of Remembrance. The format is a 4’s tournament throughout the day spread over the two clubs. All entries will be single entry and teams put together. Every game you will move so you get to play with different people. Bear’s family will be cooking all day so you won’t go hungry. The day will conclude will a presentation and smorgasbord dinner at Melbourne Bowling Club. The cost for the day will be $30.00. Non-bowlers cost will be $20.00 for lunch and dinner. If you, your business/employer or your club can help out with any donations to go towards the raffles and prizes it will be extremely appreciated. You can donate as you register or contact us on the email below. Please note: There is a link asking are you 'alreadyregistered?' in the bottom left corner. This can be ignored. Fill in your details on the screen and then press the continue button on the bottom right.